Icy giant planets like Neptune and Uranus in our solar system, are planets with a gaseous atmosphere and a rocky core surrounded by a dense slush of different ices. The ices are generally hydrocarbons made of heavier elements including oxygen, carbon, sulfur and nitrogen bonded to hydrogen. Under extremely high pressures, diamond rain can be seen deep inside their interiors. 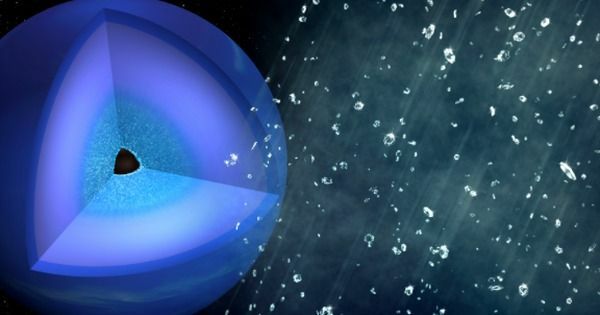 This occurs when the hydrogen and carbon are squeezed by extreme pressures to form solid diamonds. They then slowly sink towards the center of the icy giant forming a layer around the rocky core, just like rain sinks in our atmosphere towards the surface of Earth.